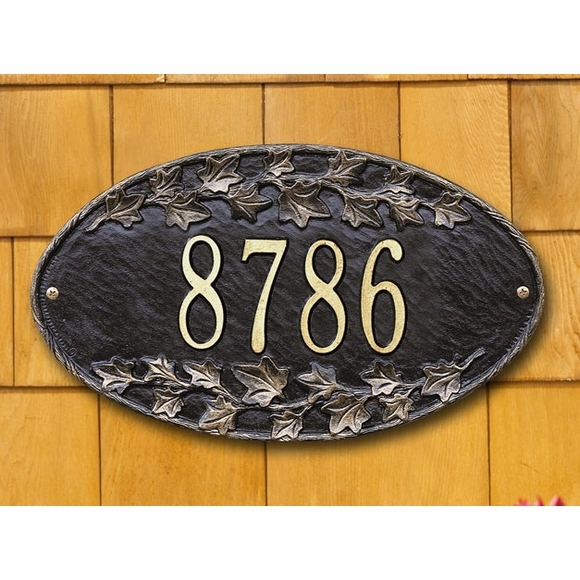 Oval House Number Sign with Flower Border - - 13.5" x 7.75" one-line house number plaque. Made in USA. Wall mount address sign with Ivy, Morning Glory, Pansy, or Rose border. Line 1 holds up to five 3" numbers or seven 2" numbers. Ivy shown above in BG black gold. Morning Glory shown in GS green silver (color no longer available). Pansy shown in BG black gold. Rose shown in RS red silver (color no longer available). Personalized floral border oval plaque for wall mount.